A professional Offshore Software Development and Web Applications Development Company from India offering dedicated hiring services for offshore web development. Hire Web Developers India(HWDI) is a professional offshore software and web development company located at Ahmedabad, India. It offers its developers for hire in various technologies for its global clients. Set in this field for almost a decade now, HWDI consists of a talented pool of experienced and expert developers to develop innovative state of the art applications for your use. HWDI covers almost all the latest and upcoming technologies and provides its services in them. It offers a well located, complete with all the resources offshore development center where you can have developers working on your project as your own employee. Bank on our web developers and hire them on hourly/monthly basis to work exclusively for your project and manage them remotely with ease. Choose from developers having expertise in both open source and other technologies such as PHP, ASP .NET, Cold Fusion, Ruby on Rails, CakePHP, Joomla, Drupal etc. Get our expert web developers and web designers for developing custom web applications for your use. Satisfaction of our clients is the prime concern at HWDI. We thoroughly go through your project requirements and provide flexible options for you to incorporate various changes at different levels. Hire web developers from HWDI to get the best resource and infrastructure to get your project done in the stipulated time. Our technical expertise combined with enhanced problem solving skills and utmost dedication is what we ensure to achieve 100% client satisfaction that too at a competitive rate. HWDI (Hire Web Developers India) is a division of Hidden Brains, an ISO 9001:2008 certified company. Having been in the field of web and mobile application software development since 2003, we aim to provide the clients across the globe the best experience in web and related services. 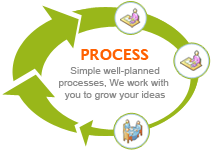 We specialize in creating dynamic solutions for otherwise complicated web solutions. To make sure that your investment in terms of time and money with us is not mishandled, we work relentlessly using our experience to provide you with world class solutions as per your needs. Select from various delivery models befitting your project requirements. Proceed further to avail our hiring services to meet your business objectives of any magnitude. Be assured of our commitment towards quality and our work once you select any hiring service from our company. We value you as a client and assure you of a secure environment apart from our integrity knowing the value of your confidentiality and the trust with which you provide us your projects to work upon. Fixed Price As per this model, HWDI provides the clients with a fixed price estimate of the total project cost. This is possible when the client clearly elucidates the project requirements and has detailed specification ready. The basic requirements for a fixed price model are clearly defined scope, schedule and enlisting of all requirements. This ensures prompt delivery according to every condition and a fixed budget that was agreed upon as per the contract. We assign skilled and professional experts as per the needs of the task so that you get timely delivery of your projects within the budget. Time and Material This particular model is apt in the situation where determining the project scope, specifications and other requirements are not entirely clear and vary greatly. The total cost is worked upon at the end based on the time and material inputs for a particular project. Under this model, monthly or weekly fees are evaluated depending on the use of hourly based development efforts. We maintain reports on every minute of work done to control the costs. Our in-house project management tool and online reporting keeps a track on the exact number of hours spent with instant access to all human resources. We supply our clients with a separate development team and infrastructure commensurate with the project load is offered for seamless and successful completion of your project. Dedicated Development Center This model works as an extension to the clients' already existing development center. You select from our dedicated developer or teams of developer to work for you on your project and manage them remotely. You can change and modify the team or the skills required at any given point of the project without any administrative or overhead costs. Our trams of dedicated developer either reports directly to the clients or to a project contact person at your end. The cost in this model is worked out per person for a month or for a fixed monthly rate for the entire team. Build-Operate-Transfer We build an offshore facility for our clients, operate from that offshore facility and customize it as per our client's needs. It is only when the model reaches maturity, do we transfer the ownership of the entire facility and resources to the client.